If home is truly where the heart is, it is no wonder that nothing beats a home cooked meal. Although not everyone may be experts in the kitchen like Chef Isaac Bancaco of Andaz, Maui or Chef Joey Macadangdang of Joey’s Kitchen, everyone can certainly stumble their way in the kitchen. Of course, everyone swears by their Mom’s version of any recipe or dish. Ever had an argument with a friend or spouse about whose Mom cooks the best adobo? Do you have a friend who swears their Thanksgiving turkey is the best? Or ever had a quarrel with a spouse because your home cooked meal is not as good as their Mom’s? Ok… too far. Home made pandesal with a side of stew. The sky’s the limit when it comes to being creative with meals made at home with love. Of all the comments made regarding favorite dish, only two mentioned having favorites made from a diner. Perhaps it could be attributed to the fact that it wasn’t until recently, most meals were enjoyed from home. Eating out was a rare occasion for many families. In my husband’s immediate family for instance, when he was growing up they almost never went out to eat, not even McDonald’s. Budget was tight and there were almost no such thing as left overs, no food went to waste. Fast forward to the present, most of us enjoy dining out more frequently than ever before. Is it due to convenience or is it because it’s more economical to eat out these days than it was before? When we take the time to cook for our family, each meal is stamped by tender love and care. When the family enjoys, the meal prepared together, it solidifies the family bond even more. Does it pay to be your own chef? Today’s daily routine for families on Maui and across America is all the same: rushed. Too little time to prepare and cook meals at home and too much time and money spent dining out or grabbing food to go. While this provides a quick fix for our exceedingly busy schedule, what is the true cost of skipping cooking at home? Finding 15 minutes, a piece of paper and pen and jot down the week’s schedule for the family. List the breakfast, home lunch and dinner for the entire week. Have a budget for the week’s list for instance $200 or less per week and stick to it. Finding 1 ½ hours in a week to shop for the week’s meals. Another extra 10 minutes to unload and put away the groceries. Set aside ½ hour to prep for the next day’s meals for the family. Set aside 1 ½ hours cooking a pot of something for home lunch for the week or so. Example: A pot of chili, pot roast, spaghetti, lasagna, or if you’re in a Filipino household, cook a pot of adobo, nilaga or sinigang beef soup, afritada, etc… Cool down and pack individually in small containers for lunch. This way, you can just grab what you need in the morning before you rush to work. Set aside 45 minutes to prepare breakfast for the family or less if it’s just for you and your spouse. Sit down and start the day together. On the flip side of this though, it is much more convenient for most working couples to grab a quick breakfast and snack at a 7 Eleven or Minit Stop, $7.50 each morning (small chicken plate, drink and a snack). Plus $9.50/plate lunch comes out to $17/per day just for breakfast and lunch. In a week is about $85. For 2 people comes out to $170. We have 4 children and if they eat breakfast in school, it will cost them around $2/meal per child totaling $8 a day and $40 a week for breakfast. Lunch is $3/meal per child totaling $12 per day and $60 per week. Now for dinner, since we have 6 in our household (2 adults and 4 children), a conservative dinner on the go can cost up to $65/per meal. In a week, 5 nights’ worth of dining out can cost up to $325. Adding everything up for the week: Parents grab and go breakfast and lunch $170 + Children’s school meals $100. + Family dinner meals $325 = $595. By setting aside a little over 3 hours a week to prep for the week’s lunch and keeping a budget of $200 for groceries, a family of 6 can save up to $395 per week or $1,580 a month. This doesn’t even include coffee or latte to go! That’s an additional $29.75 a week or $119 a month. 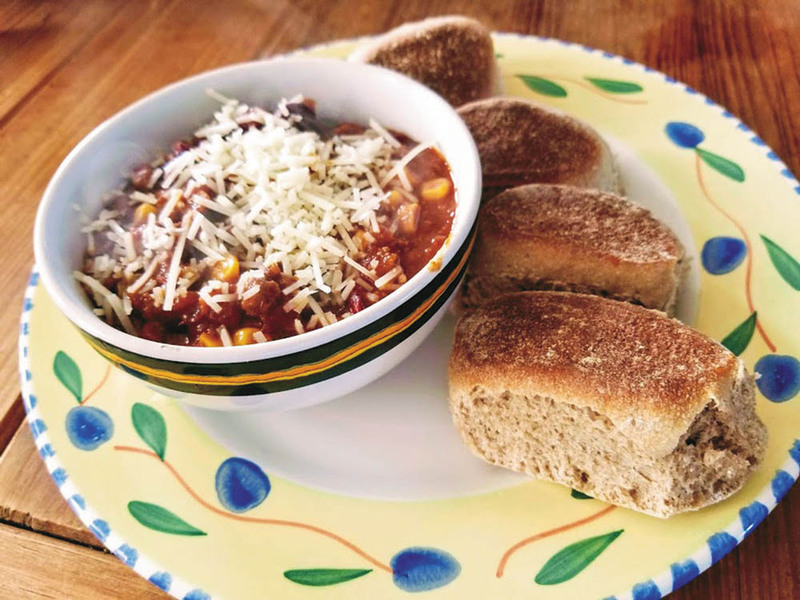 Are you one of those who run out of meal ideas quickly? Or if you’re like my children, they’re not too excited about having what we had for dinner for lunch the next day and beyond. Here are just some ideas for your weekly meal planning. Not IHOP’s (International House of Pancakes) breakfast sampler menu. If you can guess what Tapsilog is, it is safe to say that you either grew up in the Philippines or a Filipino household outside of the Philippines. Any guesses? All your guesses will be printed on next month’s print. Just joking. Okay, a Tapsilog is actually a known local breakfast in Manila. The breakdown of the word is tap-si-log: Tap is for tapa—a thinly sliced beef marinated in salt, pepper and/or soy sauce preferably overnight or longer. Traditionally dried under the sun and stored in the refrigerator until ready for cooking. Si is for sinangag—a Filipino version of fried rice. This is a good use for day old rice. In a hot wok, add cooking oil, minced garlic and salt, add a little water to rice and crumble up and add to the hot wok along with the rest of the ingredients. Log is short for itlog or egg. If you order tapsilog in the menu, expect to see on your plate a combination of sliced beef, fried rice with sunny side fried egg garnished with tomato slices. Another breakfast combination is longsilog. Can you guess this one? Simply omit the tapa on the plate and replace it with longanisa or Filipino sausage. You can come up with more combinations for this Filipino breakfast combo. The next time you see this on the menu, you will know exactly what to expect. 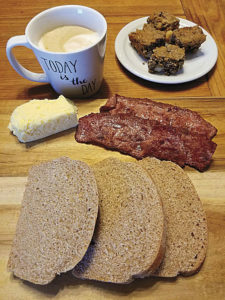 Despite the “the bad breaks” that society grades complex carbs, making your own bread makes a cost difference in your meal planning, and you control what goes in. This is only one example of lutong bahay or home cooked meal that we can enjoy in a traditional Filipino home setting. While a typical American breakfast consist of bacon, eggs and toast, a Filipino diet is a little heartier. Other ways of exploring your kitchen limits and expanding your “lutong bahay” menu is to bake your own bread? 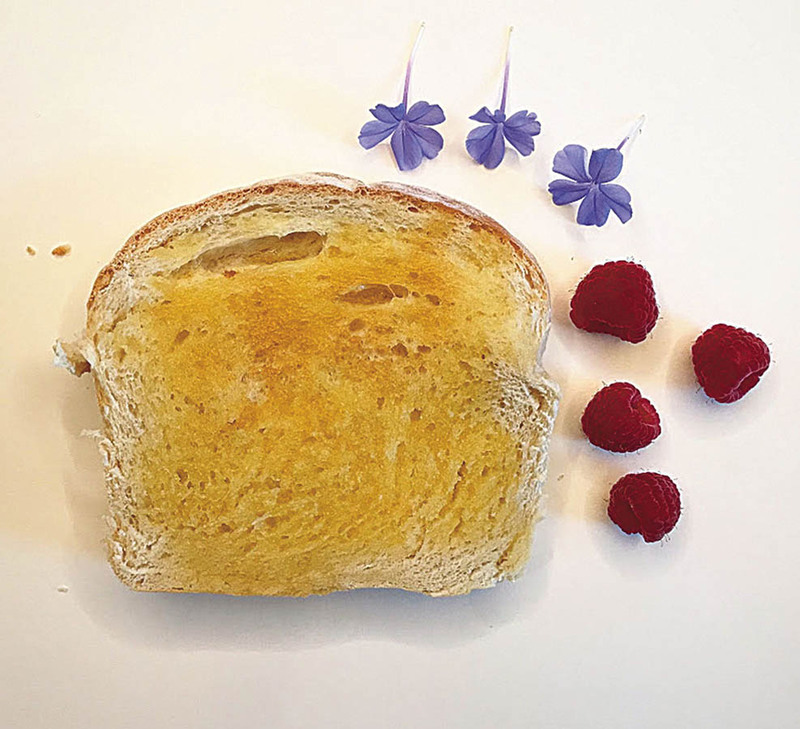 Unfortunately, these days, bread gets a bad rap from media and health magazines. Bread has been labeled under the “bad carbs” or complex carbohydrates and should be avoided. 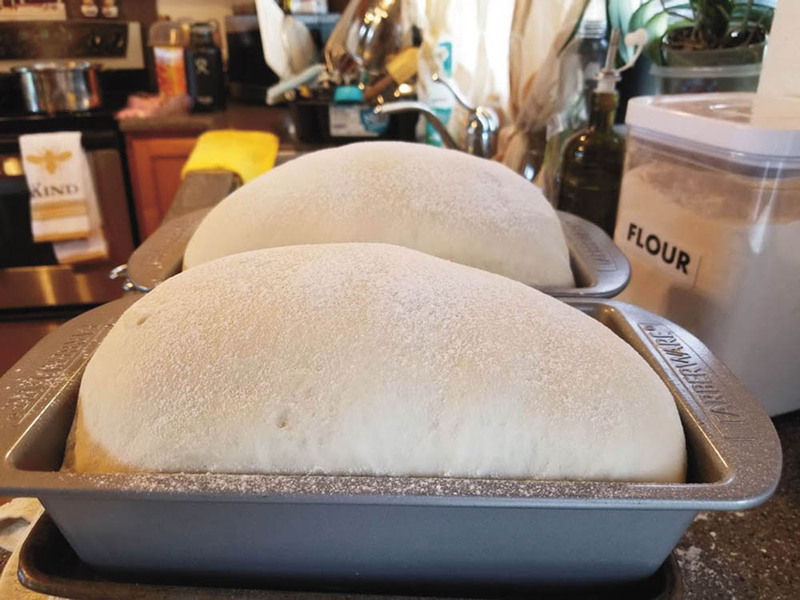 If you make your bread from your own kitchen however, you control the ingredients and your family can enjoy fresh baked bread hot out of the oven. It’s simple enough these days to find an easy recipe to follow online (I love Google for this). I tried several recipes until I found one that was simple to follow and I have been replacing ingredients to specific healthier ones of my choosing as well as adjust the measurement of sweetener. For instance, follow the recipe for “The Best White Sandwich Bread” recipe straight from Google. Not original, but it works for me. *For the rest of the recipe please send us a message and we will be happy to share. Once I perfected the 2 loaves of bread, a friend suggested I replace the regular cooking oil with that of Extra Virgin Olive Oil or EVOO. And so, I did. I also replaced the sugar with honey and the unbleached flour with wheat flour. The result, a much healthier version of the bread that my family has been enjoying for the last few weeks. I also tweaked the recipe again and combined unbleached flour with wheat, and added just a little bit more honey. Although it does take at least 2.5 to 3 hours to prep and bake—the result—happy smiles from my childrens’ faces. They get to enjoy fresh baked bread every week and I get to keep a few more dollars in my wallet. Everyone is happy. There are so many different meals we can prepare at home and be as creative as we want to be. It also makes economical sense. When we take the time to cook for our family, each meal is stamped by tender love and care. When the family enjoys, the meal prepared together, it solidifies the family bond even more. In this day and age of technology and fast-paced world, we should strive to keep this particular family tradition alive. One of the best perks for home cooked meals is the memory that will last long after it has been consumed and many times, long after the person who prepared it live. Sharon Zalsos Banaag is a past president of the Maui Filipino Chamber of Commerce (three terms) and has her own marketing business: Kalona International LLC. She’s also an ACN Independent Business Owner. A former Miss Maui Filipina, Sharon played the lead in MAPA’s presentation of Miss Saigon. 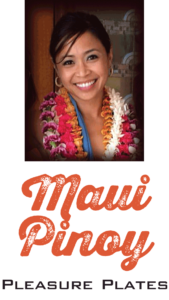 A graduate of Maui High School, Sharon is employed with the County of Maui and a proud Veteran of the United States Air Force.